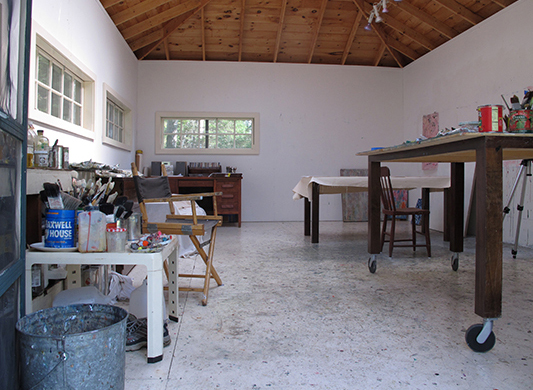 After reading The Artist’s Way, by Julia Cameron, I realized that what was “missing” and blocking me from my artistic journey was a place to call my own… a studio. Through the love, support, hard work (and a lot of head scratching), my husband, various family members and friends helped to build this wonderful, happy place. When I am not otherwise occupied by life, I love to walk, snowshoe (or even run when an idea beckons!) the short path through the woods behind my house to my studio in Freeport, Maine. Once there, I embrace the peace and quiet and immerse myself in my found object sculpture. (Sometimes, I even find something along the way to use in a new piece). It is a fitting and joyful commute, as nature and my appreciation for it have everything to do with my art. 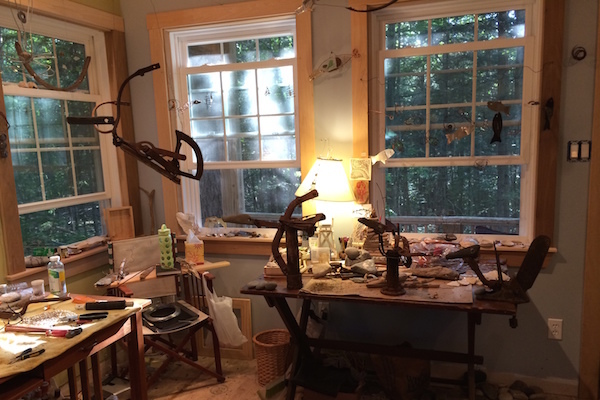 My studio is an organized (some would laugh at this), constantly changing clutter of found objects waiting to be combined, transformed and reinvented. 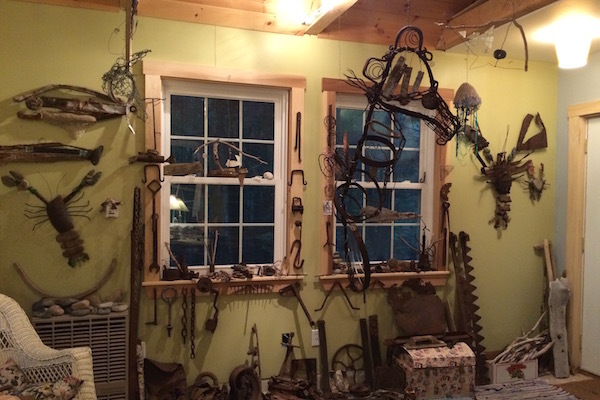 Each of the three windowed walls are lined with rusty iron objects, stone, driftwood and glass, all in their own areas and awaiting whimsy. I am grateful every day for this magical place. 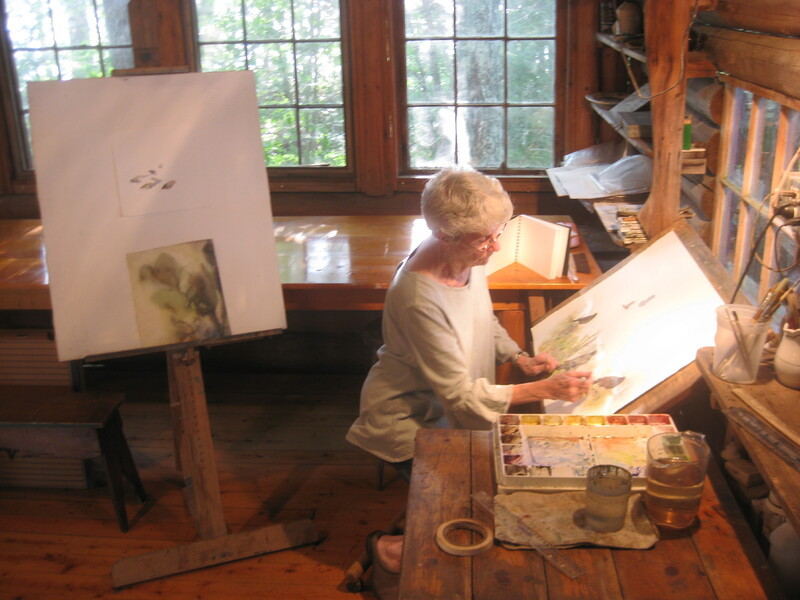 A large cabin on a lake in Orland, Maine, provides me the space and evocative light for a seasonal studio. I am indoors, although could as well be outdoors, surrounded by trees, glancing light, moving shadows, sounds of bird population including screeching eagles and mournful loons – it is an all-embracing environment and one that one can get lost into. The best thing; and distinct from my winter quarters, is a spacious clear floor where I can step back, roll on my kneeling stool, and change my viewpoint. The woodsy-ness (and indeed woodiness of the cabin) surrounds me. This view of my studio faces east. The painting walls extend to the right and then back along the south side of the building which is 24 x 16 feet. There is a roof-ridge skylight that lets in light from the north and south. Two rolling, work tables serve as palettes or as a surface for working when I prop up the top to a 30 degree angle. The left/north side of the studio is for paints, mediums, brushes, tools, a set of drawing drawers and an old couch. The “white” plywood floor gets covered with paint. I usually work on the wall but sometimes I work on the floor, which is level and still fairly smooth. There is electricity but no water. There is no heat. Simple and perfect for the task at hand, at least for five months of the year.